How scientists can encourage dialogue, respect, and mutual understanding. Scientists in the U.S. today enjoy unrivaled communication capital. They are trusted and respected by the great majority of Americans, and their expertise is perceived as authoritative, essential, and impartial. Yet on some of the biggest questions facing society, members of the public sometimes discount the expert advice of scientists. This often occurs when scientific advances and innovations are perceived as conflicting with strongly held political, religious, or social beliefs. Scientists therefore often experience a great deal of uncertainty about how to deploy their communication capital wisely and effectively. Recognizing these challenges, a new American Association for the Advancement of Science report, “Scientists in Civic Life: Facilitating Dialogue-Based Communication,” provides an overview of relevant research, practices, and examples that scientists can draw on in encouraging more thoughtful dialogue about science and society. In authoring the booklet, I spent the past 18 months collaborating with staff at the AAAS Dialogue on Science, Ethics, and Society (DoSER). The publication is the first in a series of science communication-related resources funded by AAAS, the John Templeton Foundation, and private donors. As one of the world’s largest scientific societies, AAAS has long emphasized the importance of public dialogue to its membership and the scientific community at large. “[Scientists] need to engage the public in a more open and honest, bidirectional dialogue about science and technology…addressing not only the inherent benefits, but also the limits, perils, and pitfalls,” wrote former CEO Alan Leshner in a 2003 Science editorial. Consistent with this mission, the aim of the new booklet is to empower scientists and their institutions to play a more active role in bringing Americans of diverse backgrounds together to spend time talking to each other, contributing to mutual appreciation and collaboration. Public perceptions of politically contentious science-related issues often do not reflect what people know factually about the issue, but instead mirror who they are politically, socially and culturally. Dialogue-based science communication, as I detail in the report, must therefore be sensitive to the world-views, values, backgrounds, and priorities of different groups. Contrary to conventional wisdom, on many issues, it is often the best-educated Americans who are the most prone to biased processing of scientific evidence, and to dismissing information which contradicts their pre-existing views. Researchers have not reached a consensus on explaining this paradox, but studies suggest that strong partisans with higher education levels tend to be more adept at recognizing and seeking out congenial arguments. They are also more attuned to what others like them think on a given topic, and are more likely to react to these cues in ideologically consistent ways. 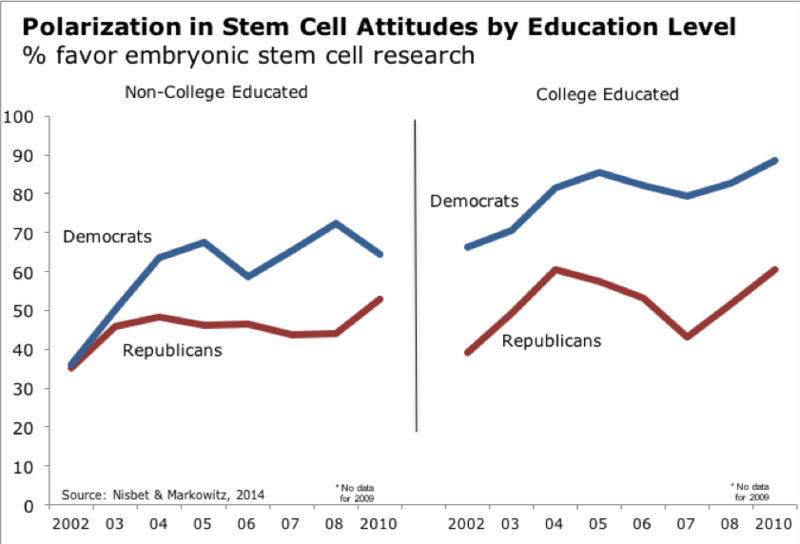 For example, in the decade-long debate over Federal funding for embryonic stem cell research, as elected officials and candidates from the two major political parties diverged on the issue, research shows that the best-educated and most scientifically literate among partisans aligned their beliefs to be consistent with the arguments they offered. By 2010, as controversy on the issue subsided and partisan leaders moved on to debate issues considered more politically advantageous, the gap in how the best-educated partisans viewed the issue began to narrow. Nisbet, M.C. & Markowitz, E. (2014). Understanding Public Opinion in Debates Over Biomedical Research: Looking Beyond Partisanship to Focus on Beliefs about Science and Society. PLoS ONE 9(2): e88473. Other studies find that better-educated conservatives who score higher on measures of basic science literacy are more likely to doubt the human causes of climate change. Their beliefs about climate science conform to their sense of what others like them believe and that actions to address climate change would mean more government regulation, which conservatives tend to oppose. Better-educated and more scientifically literate liberals engage in similarly biased processing of expert advice when forming opinions about natural gas fracking, genetically modified food, and nuclear energy. In this case, their opinions reflect what others like them believe and their skepticism toward technologies associated with big corporations and industry. Coinciding with the 2014 U.S. midterm elections, for example, the Fox News cable channel tended to frame the U.S. government’s response to the Ebola outbreak in West Africa in strongly political and partisan terms, making it easier for conservative viewers who may have already distrusted the Obama administration and/or who opposed that administration’s immigration policy to discount reassurances from government health officials that there was little need to worry. Within a few weeks of the October 2014 outbreak, polls showed that Americans had split in their views of the risks of Ebola. Republicans were significantly more likely to say they were worried about Ebola than Democrats. They also reported substantially less confidence in the ability of the federal government to handle the situation. In some cases, as a first step towards improved relations between scientists and a particular group, the goal of dialogue-based science communication, may be to simply recognize and affirm shared values, beliefs, and goals. With this established, as I detail in the report, further dialogue can be structured in such a way as to encourage working together towards common goals on politically contentious issues. If common goals on an issue may not exist, investing in dialogue-based communication can at least help establish norms of civility. In one example, the AAAS DoSER program organized six workshops in 2014–2015 that convened scientists and religious leaders to discuss topics of mutual concern and possible tension such as the teaching of evolution, climate change, and global health. Global health and climate change were identified by many participants as topics upon which scientists and religious leaders could collaborate. Human origins, evolution, stem cell research, and human sexuality in contrast were identified as topics where agreement would be difficult, but issues about which scientists and religious leaders could understand and respect their differences. Participants also expressed that the meetings helped break down stereotypes about the “other” group, facilitating learning and relationship building. deliberation and more effective policy decisions on complex, emerging issues. The goal in this case is to create incentives and opportunities for publics and stakeholders to engage in informed discussion where the best available science is made relevant to decisions that ultimately involve a complexity of social, legal, and ethical implications. removal, invasive species, the development of tidal wave power and offshore wind projects, the management of lobster fisheries, and the safety of beaches. Mitchell Center projects involve physical scientists, engineers, economists, anthropologists, and communication scholars working together to understand the physical, social, and human dimensions of sustainability issues. This interdisciplinary process extends from the campus into communities, organizations, and state agencies, as Maine residents, professionals, and stakeholders are consulted early on in the problem definition process through the implementation stage. This two-way interaction enhances expert understanding while building relationships of trust and networks of communication. Other dialogue-based initiatives can involve partnerships between scientists and their peers in the arts, humanities, and creative professions. Their work can motivate different forms of learning, sponsor critical reflection and deliberation, generate empathy for others, and produce inspiring and thought provoking visions of the future. Sean Caulfield & Roy Mills, University of Alberta; End Point, from “Perceptions of Promise: Biotechnology, Society, and Art” exhibition at the Glenbow Museum, Calgary, Alberta, November 2008–January 2009. University of Alberta in Canada hosted workshops about the social implications of human genetic engineering among visual artists, scientists, bioethicists, social scientists, and journalists. Inspired by their conversations together, the artists were commissioned to produce visual works reflecting on the themes discussed, while the other participants were asked to write short essays. The project culminated in the artistic exhibit “Perceptions of Promise,” which toured Canada and the U.S. In each country, public forums were held at museum venues, generating local news coverage of the themes expressed. Effective communication, as these examples illustrate, requires more than presenting a scientific lecture in more accessible language. Instead, scientists need to think carefully about forms of dialogue that maintain and strengthen trust and credibility while emphasizing shared goals, values, and interests. is relevant, or could be relevant, for diverse communities. An emphasis on empathy, listening and learning can foster collaboration on shared values or common goals. But putting dialogue-based principles and strategies into practice also requires a transformation in how scientists, scientific institutions, and universities view their roles, and the incentives and resources that encourage communication-related activities. Many scientists believe they lack skills in public communication, and are reluctant to share their insights and expertise outside of traditional scientific contexts. Moreover, almost all scientists lack skills and experience in facilitating genuine dialogue with non-scientific publics, despite evidence that it is only when people feel that they are being listened to that reservations can be overcome. Training workshops and other programs organized by AAAS and the Alan Alda Center for Communicating Science along with a growing number of university-based initiatives such as SciComm@Cornell and the UMass-Amherst Public Engagement Project are designed to address such concerns, and to provide scientists with the skills they need to encourage more thoughtful public conversations about science and society. To be successful, scientists should also consider partnerships with colleagues in the humanities, arts, and communication fields. These professionals can draw on literature, religious and cultural traditions, and broad ethical frameworks to enrich public discussion, and communicate about complex scientific issues in imaginative, compelling, and novel ways. Scientists will also benefit from collaborations with social scientists who, as I detail in the report, can provide insights into the factors influencing public beliefs and societal decisions; inform efforts at providing policy advice; suggest specific narratives or frames of reference to emphasize; and provide ongoing evaluation and feedback on the success of dialogue-based communication. But such partnerships and collaborations will also require dedicated sources of funding from the leaders of government agencies, philanthropies, universities, industries, and scientific institutions who recognize the importance of dialogue-based science communication to tackling pressing social problems and improving public discourse about life’s biggest questions.